I'm going to need some help with others in terms of stat inputs because I can't collect all of these partners info myself, to check them and see if they are AOE or 1v1 etc. This will help the community.Nice one Justice. I first thought that you only want partners from the picture book, but it's not complete. 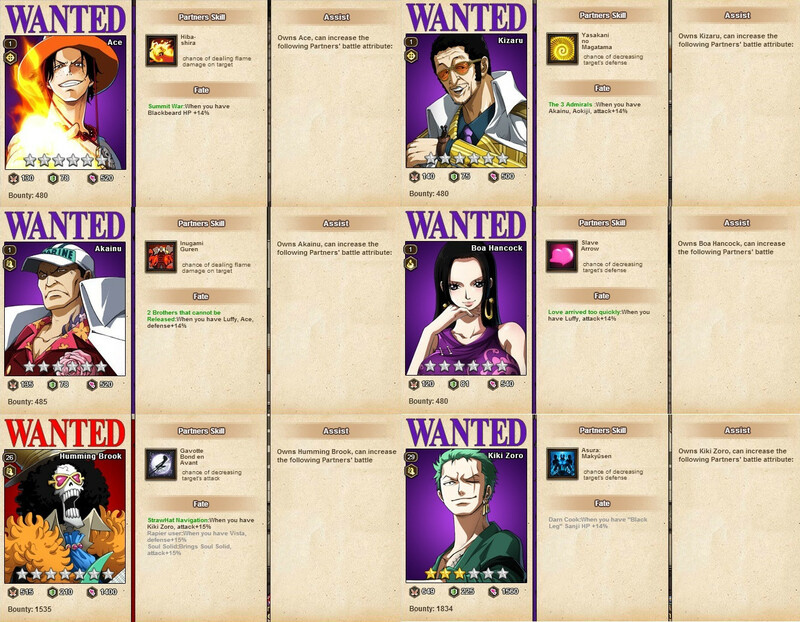 Sorry for the brook and zoro not lvl 1, it's mine. Thanks. Any chance you know if those chars are have aoe skill or if they just have 1v1 skills too? Ok thanks. I've added them on. As long as you have the other partner recruited you can get the bonus. You don't need to have it on your team to activate the bonus. GMT-6, 2019-4-26 01:42 , Processed in 0.030430 second(s), 9 queries , Xcache On.